England is under attack by strange forces from Mars! You must hurry to field forces to oppose the Martian menace before they ravage all of England and begin converting it for Martian colonization. The Tripods will first destroy your cities and send refugees fleeing across the land, desperate to escape via harbors and ships. Once an area is destroyed, Red Weed will start to sprout up, finishing their work. As England is devastated, your production decreases and your ability to produce Field Guns, Infantry, and Cavalry also decreases! When you march your forces into the same region with a Tripod wave, you get to command them in battle! Once you deploy your forces to the map, they are ready to do battle! In battle, the towering Tripods will march toward your positions as your guns do their best to bring them down. While advancing, the Tripods will attempt to detect your concealed guns. Once they do, they will blast them with heat rays! 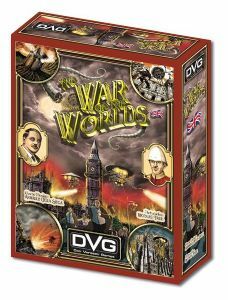 Each game turn brings the war closer to victory for either Humans or Martians! The Martians gain colonization points by destroying the land and scooping up the fleeing refugees. You gain victory points by keeping your lands healthy, destroying Tripods, and evacuating the grateful refugees! The game begins with a wave of Martian Tripods marching across England, as well as a Martian Cylinder already embedded in the ground, and preparing to construct a second wave of Tripods!